Our long-time custom here in the parish is to have devotions on the Friday’s of Lent. This year, we have added quiet days in Advent and Lent. The one for Lent will be on the first Saturday, which is March 9th. It begins with Morning Prayer and Mass in the church at 8am, followed by scripture meditations in the presence of the Blessed Sacrament, wrapping up by noon. In planning the year, we agreed that the first week in Lent is pretty busy, so our Friday program will begin after that first week on March 15th. The evening begins with Stations of the Cross at 6:30pm, followed by the benediction of the blessed Sacrament. Then we will have a supper and study in the Parish Hall about 7:30, wrapping up the evening by 8:30. For the last two years, I have offered a teaching program (on sharing our faith with Muslims and on King Henry VIII’s book Defence of the Seven Sacraments). This year, we’ve invited a slate of guest speakers to come talk to us on the over-arching theme of “Walking the Walk.” This is about putting the Christian faith into practice. I think we have a great line up. I’m looking forward to it. To start us off, we have Deacon Michael Matkin on March 15. He’s the author of The Complete Idiot’s Guide to Early Christianity and The Complete Idiot’s Guide to the Gnostic Gospels. He will share his experience about putting Christian spirituality into practice. Next we have Aurelia Green on March 22, who has recently become a foster parent and will be sharing her inspirational story. Then Father Scott Wilson will talk about tips for sharing our faith with others on March 29. On April 5 Kyle Spardley will be with us to talk about his experience with men’s ministry at Ss. Peter and Paul in Arlington. Lastly, Father Christopher Cantrell will talk to us about pilgrimage, reflecting on his multiple trips to the cathedral of Santiago de Compostela in Spain. It’s going to be a great Lent!. Several years back, Father Allen reinstituted the parish observance of the pre-Lenten season, or what is sometimes called Shrovetide. It was abolished in the revision of the calendar with the new lectionary. Epiphany became the green Sundays of “ordinary time” lasting until Ash Wednesday. But Shrovetide has had a little revival of sorts. A pre-Lent scheme was put back into the calendar of Common Worship (used in the Church of England) as well the calendar used by the Anglican Ordinariates and in the new ACNA Prayer Book of 2019. Pre-Lent begins with three “gesima” Sundays. Of these, only Quinquagesima is literally named—“fifty days” before Easter. As in Lent, the vestments are purple, the Gloria and Alleluias are dropped, and the dismissal is “Let us bless the Lord.” But Shrovetide is not quite Lent. Pre-Lent is actually the carnival season (or Mardi-Gras as they say in New Orleans). There is a certain festivity that attends to using up all the things to be abstained from during Lent. However, when pre-Lent was removed, the character of Lent was altered. You might associate Lent with repentance above all, but that’s not how it was supposed to work. In the old arrangement, Shrovetide was the time to repent, the time to be “shriven” of your sins (to make your confession and be absolved), while Lent was the time to “do penance.” As Lent was the desert experience, pre-Lent was said to be the Babylonian captivity when you prayed to return to the Promised Land. Pre-Lent is not redundant (just “getting ready to get ready for Easter”), but a unique time of transition to holy ground. Last year, the diocesan Risk Management Committee advised every parish to put together an Emergency Action Planning Committee. Although the initial motive was active shooter preparedness, the task was to look at all areas of safety and security. Our committee gave the vestry a long list of recommendations (posted on the vestry bulletin board) and the vestry approved moving forward on those items bit by bit. The first three items we’re working on is exit doors (that’s why the crèche was in a different spot this year), fire extinguishers, and locking the narthex. Some of these things have proved much more difficult than first imagined. After much investigation, a locking mechanism has been installed on the narthex doors. One of the things we insisted on was that parishioners should have access to the church 24/7. During service times like Sunday morning, the doors will be unlocked. But for parishioners coming to pray at odd hours, you will need to enter the key code. Enter this data in your phone or pick up one of the little cards from the Annual Meeting to put in your wallet. Our parish has been left open for most of our history (there are bolts on the doors from the past, but no one seems to remember if or when they were used). And we have had the challenge of our worship space being used as a shelter at times. For over a year, we have actively discouraged this, and it has dissipated greatly (security cameras helped). The main problem lately has been children skipping school and hanging out in the nave. In fact, two girls were found doing so the very morning our sexton came to finish the installation of the locks. This should resolve a liability we have had for some time, and be much less of a burden on our tremendously understaffed Dallas police being called to deal with this problem. This will be a learning curve for all of us, starting with learning to open the side of the door with the lock on it. We want everyone to feel both welcome and safe here. I am happy to hear any feedback and discussion on this matter. If you’re not ready to take down the lights and the tree just yet, you may be in luck. In his classic book on the liturgy, Fortescue notes that Christmastide runs from the first Vespers of Christmas to 13th January inclusive. In many countries, Christmas festivities continue 40 days until Candlemas on February 2nd, which is the customary time to take down nativity displays. This is still the practice in Rome. And it makes sense to end there since that is the last time we see Christ as a child in the gospel readings. Epiphany is a part of the Christmas celebration in the same way that Ascension is a part of Easter. They have been historically and scripturaly stuck together from the beginning. Both Christmas and Epiphany were octaves in the 1928 Prayer Book. The octave of Christmas Day (January 1st) commemorated the circumcision of Christ since Jewish boys were circumcised eight days after they were born. The octave of the Epiphany (January 13th) commemorated the Baptism of Christ. In the new Roman Missal and its revised calendar, the commemoration of Christ’s baptism is moved from a fixed date on the octave of Epiphany (January 13th) to the First Sunday after the Epiphany. This is also the arrangement in the 1979 Prayer Book. However, it’s still not quite clear when Christmas is over. Does the 1979 Prayer Book envision the Christmas season ending with the Epiphany or with the commemoration of the Lord’s baptism? In the weekdays between the two, one may use either the collect and propers for the Epiphany or the Second Sunday after Christmas (see page 162 and 214). Whenever you decide to take down the tree and the lights, be sure to leave the light of Christ shining in your heart. Before I address that question, we need to note two things. First is that people go to church for many different reasons, and some-times even the wrong reason can lead to a happy ending. Maybe you only came to church to get close to the pretty girl or the handsome guy, but in the meantime, God went to work on you and enabled you become a saint. As S. Paul put it, “All things work together for good to them that love God, to them who are called according to his purpose” (Romans 8:28). The second thing to note is that, technically and theologically speaking, we do not “go to church.” Rather, we are the church, and the church gathers for worship. All of us are called to worship individually and we are also called to gather together for common worship. As the letter to the Hebrews puts is, “Let us consider how to stir up one another to love and good works, not neglecting to meet together, as is the habit of some, but encouraging one another, and all the more as you see the Day drawing near” (Hebrews 10:24-25). Like so many other things in our culture, church attendance has taken on a consumerist bent. People go to church to get something out of it. People go for insights of wisdom, biblical knowledge, to be spiritually uplifted, to meet people or be with friends, or for the programs that are offered in a church. But those are side benefits. How many times have you heard someone leave a church because, “I just wasn’t being fed”? What about the opportunity to feed others? Or maybe they skipped a service because, “They weren’t going to have communion”? What about making prayerful use of the communion we already have through Christ? S. Thomas Aquinas (always a reliable guide) would remind us that we should go to church because God deserves to be worshiped. In the Summa, Thomas classifies the virtue of religion as a subset of justice. He notes, “Since special honor is due to God as the first principle of all things, to him also is due a special kind of worship.” We should go to church because as a matter of justice, God deserves to be worshiped, and he especially deserves worship from his people. Advent is probably my favorite season of the church year. We have a wonderful opportunity to make the most of it here in the parish. To start the season, we have a festival of Lessons and Carols on the first Sunday. It’s a distinctly Anglican tradition begun at King’s College in Cambridge. As we hear the lessons that build a prophetic anticipation of the Messiah’s arrival, we sing those wonderful carols of Advent and Christmas. The season is a great time for meditating on the mysteries of salvation. On the first Saturday, we commemorate the feast of the Immaculate Conception, one of the key moments in the unfolding plan of salvation, when the knot tied by Eve begins to be loosed through Mary. Our Walsingham cell usually meets for rosary on the fourth Monday, but since that is Christmas Eve, we’ll pray the rosary after the Mass on this great Marian feast. The next Saturday, December 15th will be our Advent Quiet Day. After the morning Mass, there will time for silence and confessions interspersed between meditative scripture listening to the book of Revelation. Remember, as a parish of “full Catholic privileges,” confessions are heard each Saturday morning and also special time is set aside for confessions on Christmas Eve. Each year, we have an opportunity “to adopt orphan angels” through the Angel Tree ministry. You can shop for Christmas gifts for one of these disadvantaged children and help make the season brighter. There is an Angel Tree party on the 16th. We also have a fundraiser for ministries that aid unwed pregnant mothers in our annual Evensong for Holy Innocents on December 28th. This is a season to remember the less fortunate and to be a blessing to others. It all leads up to the celebration of Christmas. As always, we have a Mass at 6:30pm on Christmas Eve for those unable to make it out later that night. Caroling begins at 10pm and the “Midnight” Mass of Christmas follows at 11pm. A Low Mass for Christmas Day is offered at 10am. Make this Advent a holy season. Most of us learned all about the Pilgrims and the first Thanksgiving in school growing up. They were Puritans who had left England because they deemed the (Anglican) Church of England to be too Catholic and wanted to live where they would be free to practice a pure Protestant faith (hence the term “puritan”). But did you know there was also a Catholic at that first Thanksgiving in Plymouth? The Pilgrims struggled when they first arrived in the New World. A tribe of Native Americans called the Wampanoag helped them get through that first harsh winter when their tribal leader Massasoit discovered that their supplies from England would not be enough food to sustain the colony through the first winter. Imagine their surprise when one of those Indians, called Squanto, not only spoke English, but turned out to be a Catholic Christian as well. In 1614, Squanto was captured by a lieutenant of John Smith who attempted to sell him and other Indians into slavery via Spain. However, some Franciscan friars discovered the plot and acquired the captured Native Americans. During this time, Squanto received instruction in the Catholic faith and was baptized. As a free man, he traveled to London where he became a laborer in the shipyards. There he also became fluent in English. Squanto was able to return to his homeland five years after his kidnapping. Since he was fluent in English, Squanto became a valuable interpreter and teacher to the Pilgrims who settled at Plymouth. During that first winter, half of the Pilgrims died of starvation, of sickness, or exposure. Squanto eventually contracted one of the diseases from Europe that were decimating his people. As he lay dying, he asked for prayers from Governor Bradford and bequeathed his belongings to his new friends in Plymouth. In God’s providence, a Catholic and a colony of Protestants had been brought together in the New World to help each other find God’s mercy. Each time an election day passes, I’m very grateful for two things. One is the fact that all the political ads come to an end. The other is gratitude that I live in a land where we fight our political battles by ballots, not by bullets. Even still, our civil discourse can become quite uncivil. And it’s always a tragedy to see friend-ships end over political disagreements. That makes me think of the enduring friendship of two people who by all accounts never should have been friends in the first place—United States Supreme Court Justices Antonin Scalia and Ruth Bader Ginsburg. One was a man, the other a woman. One was a Republican, the other a Democrat. One was a conservative, the other a liberal. In jurisprudence, one was a textualist, the other an activist. One was a traditionalist Catholic, the other a non-observant Jew. Everything adds up to them being enemies, and yet they turned out to be the closest of friends. Because we so often tend to enjoy the company of those we have some similarity to (“birds of a feather flock together”) or end up spending our days alongside those who are engaged in similar pursuits in life, we have a tendency to see commonality as the essence of friendship. But this is a mistake. The essence of friendship is charity. Friends are those who love each other; enemies are those who refuse to love each other. The English monk S. Aelred best known book was Spiritual Friendship. Aelred taught that it is both a gift from God and a creation of human effort. While love is universal, freely given to all, friendship is a particular love between individuals, of which the example is Jesus and John the Beloved Disciple. Jesus gave us an example to follow. God wants us to have friends. When I see the horrible stories about the cover-up of pastoral pederasty, my mind goes back immediately to S. Thomas Becket. Now Becket was not such an offender; he was a saint. What makes me think of him is the issue that led him to martyrdom—defending the rights and independence of the Church from the reach of secular law and the control of the state. We look to Becket as a hero who gave his life defending the Church. His triumph was enshrined in Magna Carta—“the Church of England shall be free.” But the fallout was Becket’s curse—the officials of the Church shall be free from secular accountability. The controversy turned over whether some priests were to be tried in secular courts after ecclesiastical courts. If the Church was diligent in enforcing its own laws (as it has in the past), it should be handing its priests and bishops over to the secular authorities along with boxes of evidence after they had been not just laicized, but formally degraded from Holy Orders. In his recent statement alleging corruption and cover-up of the sexual abuse scandal in the Vatican, Archbishop Viganò claimed Pope Benedict censured Cardinal McCarrick to a life of prayer and penitence and that Pope Francis rehabilitated him. By the way, there are special places set aside for lives of prayer and penitence; they are called penitentiaries. But what about Cardinal Wuerl? Cardinal Law? Cardinal Mahony? Cardinal Bernardin? Cardinal Spellman? Critics responded to the Viganò statement, Where is the proof? The Archbishop claimed in his statement, “All the memos, letters and other documentation mentioned here are available at the Secretariat of State of the Holy See or at the Apostolic Nunciature in Washington, DC.” Pope Francis told the press to check and see. But will we ever see such documentation? Not as long as the Church has the mindset that governed the actions of Thomas Becket. When S. Peter said “we will obey God rather than men” (Acts 5:29), that was in response to those men who commanded them to stop preaching. It was not a claim for clerics to be above the law. After all, Peter also said, “Submit yourselves for the Lord’s sake to every human institution [e.g., to kings and governors] for the punishment of evildoers” (1 Pet 2:13-14). Would it surprise you to know that the largest church in our diocese is the Spanish-language congregation San Juan in Fort Worth? The largest Anglican province in the world is not the Church of England, but the Church of Nigeria, which has about 50 times the number of people in church on a typical Sunday and is still growing rapidly. Across the “Bible Belt,” we may feel like a community where most people go to church, but did you realize that less than a third of people are in church here on Sunday mornings? And less that 20% of Americans go to church regularly in what is considered the most church-going nation on earth. In America, which is considered the “most Christian nation” in the world, churchgoing is increasing and shrinking at the same time—increasing in raw numbers and shrinking as a percentage of the total population. Hawaii (of all places) is one of the few states where church attendance has been growing lately and at a rate faster than any other state (but it’s starting near the bottom in church attendance). Would it surprise you to know that the number of Christians in Communist (and officially atheist) China is growing so steadily that by 2030 it could have more churchgoers than America? At a time when churchgoing is on a decline here, it is exploding in Africa and Asia in both adherents and attendees. Since the ending of Mao’s violent anti-Christian crackdown of the Cultural Revolution in 1976, Christianity has been expanding in China at a steady and increasing rate. Even more astounding is that these figures really only account for China’s official recognized churches and do not include the wide numbers that attend underground house churches. God promised that the gates of hell would never prevail against his Church. In these changes, we see the old adage being demonstrated about all things becoming new. Jesus who appears to his disciples in today’s gospel is first thought to be a ghost. He convinces them that he is real and that it’s really Jesus by showing them his wounds—signs of his identity and of his physical reality. Given their mistake, it seems that they already believe in ghosts. What does the Church say? Except for the Holy Ghost, not much. The Bible certainly does address the issue of dealing with evil spirits in that it explicitly forbids engaging in pagan worship, conjuring up the dead or spirit-guides (what we call necromancy—things like Ouija boards and mediums and séances), and anything that might be called magic (trying to manipulate the material world by spiritual means). And, of course, the Bible has much to say about Satan and the other fallen angels, usually called devils or demons. There is only one curious incident in the Bible where a ghost is actually mentioned—the famous story of the witch of Endor in 1 Samuel 28:2-25. In this event, a sorceress conjures up the soul of the dead prophet Samuel from Sheol at the demand of King Saul, who has been unable to obtain guidance by orthodox means. In a straight-forward reading, the spook really is the spirit of the dead prophet. Some Church Fathers argued that it was really a demon in disguise. Other commentators argue that while spirits do not really roam the earth and we cannot summon them, it happened as a special event in God’s providence. The church has historically had a teaching about ghosts, although it is “unofficial” and you’d be pretty hard pressed to find anything about it in most Catholic or Protestant literature. Basically, the idea is that ghosts are (non-material) spirits of departed people (presumably those who are either “in” hell or “in” purgatory) who have an attachment to some material place or object. Many accounts seem to relate to an event of trauma, or being stuck in some “historical loop” which plays over and over in a particular place. Today’s message is that Jesus is not a ghost. He’s not the walking dead; he’s back from the dead and lives and reigns for evermore. On Thursday, the decision of the Fort Worth Court of Appeals from 2015 was finally published and the news is that we lost. To put it briefly, when the Episcopal Church sued the Diocese of Fort Worth in 2009 for all its property, TEC won at the trial court, then we won at the Supreme Court (which reversed the trial court), so then the trial court decided in our favor according to the high court’s ruling, and now the Appeals Court has reversed the trial court in the other direction (this time in favor of TEC). It has been a dizzying back-and-forth. One thing has always been clear, which is that the last word from the court is the only one that really counts. Does this affect our parish? Not directly. That is, our parish land and buildings are owned by the Diocese of Dallas (from whom we rent them) and the contents and bank accounts are owned by the parish. None of these were a subject of the lawsuit brought against the Diocese of Fort Worth by the Episcopal Church and its local loyalists. But of course, we are part of a diocesan family, so it does affect us indirectly. The litigation has been draining over the years—emotionally, spirituality, energetically. It was hoped that we were nearly at the end, but this will probably add on a few more years to the process. Bishop Iker has indicated that the diocese will pursue its legal rights again in the Texas Supreme Court. I bid your prayers for our legal defense team (Shelby Sharpe, Scott Brister, and David Weaver). Pray for wisdom, guidance, and protection for them as well as for the judges and justices handling our case. Pray for clarity of mind and thought. When the case first began, Shelby Sharpe met with the bishop and clergy of diocese. Among the things he mentioned was that this would be a long battle with a lot of twists and turns. It is as much a spiritual battle as a legal one. He stressed that the legal team will fight for us in court, so leave that to them. Our focus instead should be on gospel ministry—worshiping, teaching, sharing, evangelizing. One of the things that a visitor would notice today is the veiling of images. In my seminary chapel (where a curtain was strung across the entire reredos behind the altar) one visitor mistakenly thought that construction work or painting must be taking place. An old custom called “Lenten array” is to cover the cross and other images like icons and statues with uncolored cloth, with the cloth often bearing a black or dark red symbol of the item being covered. A slightly later tradition (which we follow here) is to veil with purple cloth all crosses and images of the Lord during Passiontide, which is the last two weeks of Lent. Scholars believe this tradition is most likely linked to the gospel text for what used to be called ‘Passion Sunday’ (the Fifth Sunday in Lent), which speaks of Jesus hiding himself from the people (John 8:59). Many of us have experienced this veiling over the years and perhaps never asked, Why? It can be a stark change. And like the disappearance of the Gloria and “Alleluia”, marks a special penitential character of the season of Lent. In this sense, the veiling functions like sackcloth and ashes—signs of mourning. The veiling of images also dramatizes the separation caused by sin. Guilt and shame lead us to hide things that are precious. We have a tendency to cover up the things of God or to want to look away. We don’t want to be found out. We love the darkness. These veils remind us of our discomfort with the truth, the pain of looking God in the face, and our never-ending capacity for self deceit. Perhaps the veils conceal a glory we are not yet able to bear. They are like the veil Moses wore over his face after he spoke with the Lord. Veiling reminds us that we are not yet ready to see some things, like the disciples who were not yet ready to recognize the risen Lord on the road to Emmaus. In any case, the removal of the veils at Easter, gives us hope that we, with unveiled face, are being changed into Christ’s likeness. The priest celebrating Mass on this Sunday lays aside the somber and dark purple and wears a lighter rose color instead because it is a time of joy and refreshment in this penitential season. This is signified in several ways. The vesture is a lighter color than the other purple days of Lent. During this season, there is a tradition in the Western church of returning to the older practice of acapella singing. If that is practiced, the organ may be played again on this day and flowers may be put on the altar. Today is known as “Laetare Sunday” from the old Latin introit: Latare, Jerusalem—“Rejoice, O Jerusalem.” Today is a time of restrained joy even in the midst of sadness, mourning, and penitence. It is also known as Refreshment Sunday or the Sunday of the Five Loaves. It was also called Rose Sunday because the Golden Rose, sent by the popes to Catholic sovereigns. Those are blessed in Rome on the Fourth Sunday in Lent. In England, it is also called Mothering Sunday. On this day it was custom to make a pilgrimage to the cathedral—the mother church of the diocese. On this day, it was also customary that posies would be collected and distributed to mothers and women in the congregation. Another tradition associated with Mothering Sunday is the practice of “church clipping” whereby the congregation form a ring around their church building and holding hands, embrace it. It became a day when domestic servants were given a day off to visit their mother and family. The Fourth Sunday in Lent it is generally celebrated as the British equivalent of Mother’s Day in America. So far, we’ve talked about the Lenten disciplines of fasting and abstinence. Now let’s talk about another Lenten discipline—almsgiving. One custom during Lent is to have a “fasting fund.” Take the money that you would have spent on those meals at home or those nights dining out during Lent and give it away to a charitable purpose, particularly toward relief of or ministry to the poor, who are especially close to the heart of our blessed Lord. Although it may not seem like it at the time, almsgiving is also done for our own benefit. It is to teach us how to keep God first in our lives and how to be unselfish people. It helps us empathize with others and turn those sentiments into actions. Those who truly love God and their neighbor instinctively think of others first and want to share their blessings with those less fortunate. Almsgiving is by no means confined to Lent, but it is something we focus on during this holy season because we’re getting back to the basics. Each year our congregation’s “fasting fund” will go toward our companion diocese of Northern Malawi—Anglican churches serving the poorest part of Africa. Even a small gift can have a tremendous impact in that country where every dollar goes so much further than it does here. We will collect these alms on Palm Sunday. You may bring cash or coins that you have collected or a check written to the diocese with “Malawi General Mission” in the memo. You can read more about our mission partnership with our brothers and sisters in Northern Malawi at fwworldmission.net. In Matthew’s gospel, Jesus said, “When you give alms, do not let your left hand know what your right hand is doing, so that your alms may be in secret; and your Father who sees in secret will reward you”(Mt 6:3-4). Yet, simple fasting is the older and original Lenten discipline. 1. Fasting opens us to God. It is about being mindful of our dependence upon God, and asking him to be at work in us. Jesus fasted before he began his public ministry. Moses also fasted forty days before receiving the Torah. The Church in Antioch fasted and prayed for direction and the Holy Spirit called out Barnabas and Paul as missionaries. Fasting prepares us for spiritual blessings. That’s why we also have the ancient custom of fasting from midnight before receiving Holy Communion at a morning Mass. 2. Fasting is also a sign of penitence or sorrow. In the Old Testament, we see people like David and Nehemiah fasting to express grief upon the arrival of tragic news. In the Church, we use fasting and abstinence as signs of sorrow for sin and to commemorate the passion of our Lord by the traditional Friday abstinence from meat (outside the Christmas and Easter seasons). 3. Fasting is a way of training in righteousness. This is the practice we call mortification. S. Paul wrote, “If you live according to the flesh you shall die, but if by the spirit you mortify the flesh, you shall live” (Rom 8:13; cf, Col 3:5; Gal 5:24). The idea is that we should train ourselves to control our appetites, lest we grow lazy and our appetites control us. God wants us to flex the muscle of our will, so that it can grow strong for the day of battle. If we are able to deny ourselves a small and legitimate indulgence, it will help us be practiced in the art of saying “no” for the day when a sinful temptation comes along. Fasting builds a will like Jesus’ will—always obedient to the Father. Silence and stillness is a big part of the spirituality of Lent. Of course, it is not unique to this time of year, but it is a tool that many people will use during this special time. There’s a long history of this discipline in the Christian tradition going back to origins of monasticism in the desert fathers of Egypt. I’ve been participating in silent retreats since seminary. An annual silent retreat is required for clergy in our diocese, and most of us attend the diocesan silent retreat each January at the secluded Jesuit retreat center in Lake Dallas. It is no secret that some priests just can’t stand it. They hate silent retreats. I like them alright, but I have to admit how jarring it can be at the beginning. It’s not just about turning off the TV and the computer, etc. The silence can be quite . . . loud. When the hum and buzz and talk of everyday modern life goes silent, all you hear the traffic way off in the distance, the birds chirping, the wind blowing, the sound of the floor and the carpet, and the sound of your own breath. The idea is that the only sound we make is the voice of prayer and song or the edification of the guest preacher. It is a time for listening. The trouble is (metaphorically speaking), if we can’t even hear the sound of the birds or the wind, how can we expect to hear the voice of God? The discipline of stillness and silence is an exercise in helping us learn the art of listening. Consider this Lent how the practice of stillness and silence might be a part of your spiritual journey. It could be a short quite time each day, an hour or an afternoon or a day each week. Find something that can work for you and nourish your soul. It could be an investment that will pay dividends. Traditionally, that means the days of Lent are observed with fasting (i.e., one full meal with meat and up to two snacks) and on Fridays in Lent (as on other Fridays) we add the total abstinence from flesh meat. Fish has not been considered meat in this sense, hence the tradition of fish on Fridays. Most people also like to give up something else for Lent. It can be abstinence from any food that is a treat, such as coffee, sodas, chips, or desserts. Or it can be some indulgence we give up, such as tobacco or alcohol. Almsgiving. Many families collect the money they would have spent on meals they fasted from and give that money to charity. On Palm Sunday, we will collect those funds to send to our companion Diocese of Northern Malawi, located in one of the poorest regions on earth. Your alms will greatly benefit our brethren. Worship. Another Lenten tradition is to increase our acts of piety and devotion. Consider committing to praying one or more of the Daily Offices from the Prayer Book at home with your family. Consider adding one (or one more) daily Mass during the week. Start new spiritual habits. Spiritual Reading. Disciplined reading from the Bible or from a Christian spiritual writer is a perfect devotion for Lent. You are welcome to borrow one of the books from the church library for your spiritual reading. Just return in when you are done. Plan to join us next Sunday for lunch and our Annual Parish Meeting after the 10:15am High Mass. This is the first time we’ve held it in January to comply with the Fort Worth canons (the Diocese of Dallas holds annual meetings in November). Reports are given at the meeting on various matters in the life of the parish and we talk about our future plans for ministry in the new year. Elections are held for vestry (3) and for delegates (2) and alternates (2) to diocesan convention. If you recall, we are in the process of transitioning from a 12 to a 9 member vestry, so we elect 3 new members each year now, rather than 4 as we did in the past. Another difference from previous years is that we received nominations from our nominations committee and from the parish at large for the past month so that the ballot could be published in advance of the meeting. This is for several reasons: to help us be better organized and not to throw everything together at the last minute, to give time for nominees to be vetted, and to make sure we have a full slate of candidates to consider. I am very pleased with the candidates we have to choose from and thank them for being willing to serve as a part of the leadership team of the parish. Please look over the list and contact any for whom you may have questions. Delegates (and alternates) represent the parish at the diocesan convention in mid-November and at quarterly Deanery meetings. Vestry members form a leadership team with the rector, overseeing the facilities and serving as liaisons to parish groups and activities. An annual meeting is always an occasion to celebrate the past and look to the future. We want to recognize some of the servants among us. I want to personally thank all of you for such dedication and devotion—in worship, in prayer, in giving, and participating in our various ministries. You are a treasure! We also want to prayerfully consider how each of us might serve the Lord in this place in the coming year. Find your ministry; find your apostolate. What part will you play in the life and ministry of our parish? One of the most common misconceptions is that Christmas began as an attempt to Christianize the pagan festival of the winter solstice, which the Romans called the “Birth of the Unconquered Sun.” The idea goes back to two scholars from the late 17th and early 18th centuries—Paul Ernst Jablonski and Dom Jean Hardouin. But they had made a mistake. The actual history was somewhat different. There was actually no celebration of the solstice in Rome until the year 274, when the emperor established the festival. It seems he did this in an attempt to unite many of the pagan cults of the empire—an empire which was falling apart and wanted a rebirth of the glorious days of old. And it appears as if it was an attempt to co-opt a Christian holy day at the same time—a promising new religion that was gaining ascendancy in Rome. It was commonly held in the ancient world that great figures of history died on the same day that they were born or conceived. The Bible tells us that Jesus was crucified on 14 Nisan (in the Jewish lunar calendar), which was believed to have fallen that year on the 25th day of March. So the early Christian came to be of the opinion that he was conceived after the angel visited Mary on March 25th. This became the feast of the Annunciation. With a pregnancy of nine months, that put Jesus’ birth in December. The choice of December 25th is the result of attempts among the earliest Christians to figure out the date of Jesus’ birth and had nothing to do with pagan festivals. And the pagan feast which the Emperor Aurelian instituted on that date in the year 274 was not only an effort to use the winter solstice to make a political statement, but also almost certainly an attempt to give a pagan significance to a date already of importance to Christians in the Roman Empire. Our Annual Parish Meeting will be on Sunday, January 21, 2018 after the 10:15am High Mass. This is the first time we’ve held it in January to comply with the Fort Worth canons (the Diocese of Dallas holds annual meetings in November). Members of the parish (baptized and confirmed) who are adult (at least 18 years old) communicants in good standing are eligible to vote as well as to nominate and be nominated for office. Communicant means not just that you have received communion three times in the year, but also that you are active in the parish—faithful in worship and in working, praying, and giving to the kingdom of God in this place. The rector and financial secretary will have a list of those who are active communicants and givers of record. It is expected that nominees be willing to serve and be a part of the leadership team of the parish. Delegates (and alternates) represent the parish at the diocesan convention in mid-November and at quarterly Deanery meetings. Vestry members form a leadership team with the rector, overseeing the facilities and serving as liaisons to parish groups and activities. In the past, we have had nominations from the floor at the meeting. Last year, we were in a transition, and this time we have a nominations committee of the outgoing vestry members (Bob Davis, Catherine Rogers, and Mitch Bramlett) who will receive nominations from the parish in advance of the meeting. The deadline for nominations is Sunday, January 7th. Nomination forms are in the narthex and may be turned in to the nominations committee or to the church office. God himself entered the mission field. He got involved through his prophets. He started a family with Abraham who became the father of a nation. He intervened in history with the Exodus. And he came to earth himself when the Word of God became flesh and dwelt among us. Sometimes we have to remind ourselves that the world outside the church is God’s mission field, and as Jesus said, the field is white for harvest. God wants us to go gather what he has planted and grown for the kingdom. A great Archbishop of Canterbury named William Temple was famous for saying, “The Church is the only organization that does not exist for itself, but for those who live outside of it.” Disciple-making is a part of our DNA, but we too often forget that. The holiday season is a wonderful time to invite people to church. It’s a great time to talk about Jesus openly (after all, he is the reason for the season). We have our caroling service at 10pm on Christmas Eve in addition to a wonderful concerted Mass from Hayden. People are generally more open to coming to church events during this time of year than they might otherwise be. God is always making a move in people’s hearts and we want to be a part of what God is doing. Take one of the little invitation cards next to the bulletins in the narthex and keep it with you to give to a friend or a stranger that God might put in your path. 26 November 2017: Thy Kingdom Come? How do you know when to use each one? If you look through the various Prayer Books throughout the Anglican Communion, you will notice a pattern about this. Typically, when the Kyrie (“Lord, have mercy upon us . . .”) precedes the Lord’s Prayer, then the short version is used. When it does not, the longer version with the doxology is used. Originally, the longer version was not used in the Western liturgy. In the first Prayer Book of 1549, the priest said the prayer up to “lead us not into temptation,” and the people responded “but deliver us from evil.” In the next Prayer Books of 1552 and 1559, the prayer is not printed, so we assume the doxology was not added. The rubric directs that the people are to repeat the prayer, line by line, after the priest. Starting with the 1662 Prayer Book, the Lord’s Prayer is said at the beginning (short version) and then the longer version with the doxology is said after Holy Communion. The Lord’s Prayer is found in Matthew 6 and Luke 11, though the prayer was used daily long before those gospels were written. But it may surprise you to learn that the doxology is not original to the prayer and does not appear in most Bibles. The doxology first appears historically in the Didache (8:2), called the “Teaching of the Twelve Apostles,” and seems to be inspired by 1 Chronicles 29:11. In my home church growing up, there was a scripture verse inscribed in fancy gold lettering over the main entrance door from Habakkuk 2:20, which reads: “The Lord is in his holy temple; let all the earth keep silence before him.” It was a little reminder that in entering a sacred space, we should behave appropriately. I couldn’t help but compare the two and think that we could do a little better. I’m grateful that a parishioner has offered a memorial gift to make that possible. This week, the vestry approved the design from our signage committee (and haven’t the new campus directional signs been wonderful, by the way!) for scripture verses to be inscribed with calligraphy at three thresholds to the church building. Much like the three sections of the ancient temple of Jerusalem, these passages greet the worshiper at the entrance to the narthex, the entrance to the nave, and the entrance to the sanctuary. The first two will be written above the doors, and the last on the final cross-beam that goes over the altar rail. The outer entrance has Psalm 42:1, often used at baptisteries, which is where one enters the Catholic Church. The entrance to the nave has Psalm 43:4, which is used by the ministers to prepare their hearts for worship as they enter the church. The crossbeam at the sanctuary has 1 Peter 2:24, which is a reminder of the sacrifice of Christ on the cross, which makes our peace with God. The design has been worked up in Photoshop so we can see it before it goes into place. I posted the images on the narthex bulletin board next to the orange sign I mentioned earlier. Have a look. We anticipate them to be in place in the next several months. Many Christians have an understandable concern about Halloween, pointing to its pagan origins and emphasis on evil. However, what many do not realize is that the pagan origin of Halloween is a myth. Many claim that it was an attempt by early Christians to “baptize” the Gaelic harvest festival of Samhain. But this is simply not the case. In fact, the reverse is true: Halloween (that is, “Hallow’s Even”) has always been a Christian celebration that neo-pagans attempted to “baptize” and claim as their own a few decades ago. Evening vigils lave long been held on the day before a feast and so Halloween falls on October 31 because it is the vigil of All Saints’ Day, and not because the Church wanted to co-opt a pagan celebration. In fact, Samhain was not a pagan “Festival of the Dead.” It was a harvest festival that marked the beginning of winter in Ireland, and historical evidence does not support the idea that it involved jack-o-lanterns, witches, ghosts, or religious ceremonies. Of course, whatever the origins, we should avoid the temptation to give too much attention to dark things at this or any other time of year. It is a time to honor the saints, to remember the departed, to pray for their souls, to be mindful of our own mortality, and to celebrate the life we have been given. Halloween is spooky (and rightly so) because death scares us (and rightly so). But our joy as Christian people is that Jesus has overcome death, hell, and the grave. He doesn’t enable us to avoid it, but to come through it to something better and more wonderful. These evening vigil parties have always had wide secular appeal (think Halloween, Christmas, and Mardi Gras). The original Puritan attack on Halloween was also accompanied by a similar effort to suppress Christmas and Ash Wednesday. Ironically, one of the most popular modern Christian alternatives to celebrating Halloween is a secular “Harvest Festival,” which actually has more in common with the Celtic Samhain than it does with All Saints’ Day. We have to remember that these popular customs and celebrations give us an inroad into the broader secular culture. So let’s make the most of it. Just a few days ago, I received word that one of my old seminary professors, Fr Daniel Westberg, died very unexpectedly. He went sailing on upper Nashotah lake and did not return. Father Westberg started teaching at the seminary 17 years ago while I was a student. He was just about to retire. 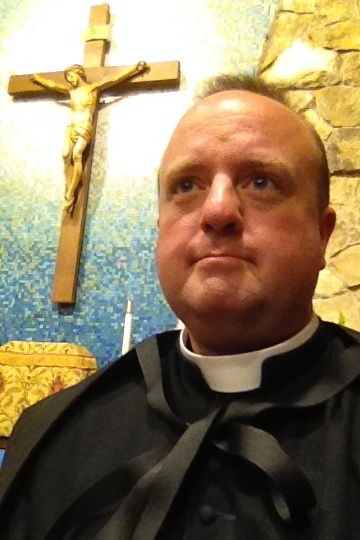 Last summer, I was able to return to the seminary for the first time for a sabbatical. When I was filming the “Saint Francis and the Winged Christ” video by the dean’s chapel, Father Westberg was up in his office organizing for the Fall semester. I visited with him and got caught up on old times. I think if there was one professor I would have wanted to see again, it would be him. He was a good man, great teacher, and a dear priest. One of the lines in the Great Litany that has always caught my attention is the petition that concludes: “. . . and from dying suddenly and unprepared, good Lord deliver us.” Death certainly comes for each one of us. For some, it may be sudden and unexpected; while for others it will be clearly seen in advance. For the most part, that reality lies beyond our control. But we do have a role to play in being prepared for death whenever it comes. Make a will—to provide for your family and for your church. Practice virtue day by day. Jesus called this heavenly treasure. Examine your conscience regularly. Go to confession. Do not let words of forgiveness and love go unspoken. “Do not let the sun go down on your anger” (Ephesians 4:26). Ask for God’s grace—for the grace of final perseverance for yourself and for grace for others. Don’t enter heaven alone! A friend of mine once showed me a love letter he wrote to his children. He wanted to make sure that such an important message did not go unshared. So he sat down and composed exactly what he wanted them to know about his feelings for them, his hopes and dreams for them. What a gift! As I looked the letter over, it occurred to me that this is essentially what we have in the Bible. That love letter can sit on the shelf collecting dust, an honorable memento that has nostalgic value but does nothing to shape our lives. Or that love letter can be read, pondered, and remembered. If it is, the love letter will shape the way we see the world. It will change the way we see our Father and our brothers and sisters. The love of the Father toward us can nurture love returned to the Father and love shared with others. His love letter gives us insights into the Father’s heart and mind, teaching us gradually to think the way he thinks, to feel the way he feels, and to will what he wills. You have a love letter from our heavenly Father in the pages of holy Scripture. Don’t just let it collect dust on the shelf. Don’t let the gift be given in vain. The best gifts are put to good use. Take a moment each day to read and ponder a little more of the love letter from our heavenly Father. Last Sunday, I talked with our children about guardian angels. In the hymn “Ye watchers and ye holy ones,” Athelstan Riley gives us an exposition of the hierarchy of heaven with the traditional arrangement of “nine choirs” of angels in addition to the faithful departed. In theology, these hosts of heaven were determined to be ordered in three triads (that is, three groups of three). The first angelic triad continually worships God in his immediate presence. These spirits consist of the exalted love of the fiery Seraphim (seraph literally means “fire”), the complete intuition of the Cherubim, and the perfect power of the Ophanim, or “Thrones.” The primary function of their being is to be present in the heavenly court and to attend to the perpetual adoration and praise of the divine Substance. The second triad extends this divine praise and love to his creation. The spiritual Dominions, Princedoms, and Powers execute the love, knowledge, and power of God relative to the general structure, order, and governance of the cosmos. The last triad serves the divine love towards humans when the Virtues, the Angels, and the ruling Archangels, come to serve and care for people on earth. Angels then truly become “messengers” of divine favor. These are the angels we find making appearances on the pages of the old and new testaments. Overall, the God-centered hierarchy moves from the freedom and might of contemplative adoration (by the Seraphim, Cherubim, and Thrones) through principled order and sovereignty of creation (ruled by the Dominions, Princedoms, and Powers) to active service toward others in a spirit of compassion and care (by the Virtues, Archangels, and Angel choirs). This week, four continuing Anglican jurisdictions will be having their provincial synods in Atlanta. At the conclusion of those individual meetings, they will meet together and sign an historic statement recognizing full communion among them. The specific jurisdictions involved are: the Anglican Church in America (ACA), the Anglican Catholic Church (ACC), the Anglican Province of America (APA), and the Diocese of the Holy Cross (DHC). The latter two are “ministry partners” of the ACNA. These four Churches represent 300 congregations in the United States as well as larger memberships in countries around the world. It has been a long journey to reach this agreement. Why is this significant? “Continuing” Anglican churches are those who left the Episcopal Church in the 1970s in protest over changes in theology, the Prayer Book, and the ordination of women. One jurisdiction (the APA) traces its history back to the 1960s when some parishes left over the lack of discipline for the heresy of Bishop Pike. When these parishes left, they organized into dioceses, but their attempt to organize as a province (ironically intended to be called “The Anglican Church in North America”) failed because of disagreements over canon law and over personality conflicts. Their statement of principles can be found in the “Affirmation of St. Louis,” named for a congress of Anglicans that met there in 1977. Petty differences and hurt feelings kept them apart and created even more splits. It is a sad lesson in how our personal faults keep the church from fulfilling her calling. Many of those involved in those disagreements have passed on. These churches have grown and attracted new generations and have now determined to get their own house in order. Let us pray that such an endeavor may be successful and that the call to unity may bear fruit among them and among all traditional Anglicans. Our bishop has been invited to participate as a guest and observer. Perhaps we are seeing our future. Back in Comanche, people seemed to take great pleasure in referring to the Historical Society as the Hysterical Society. And of course, each of the country churches I pastored was built in the 1800s and had its own hysterical marker, I mean, historical marker. . . . Or do I? When history turns into real-life hysteria, it’s no joke. I know that many have been distraught over the removal of the statue of General Robert E. Lee from Lee Park and similar occurrences around the country. Lee’s story is a great irony. He was against slavery, against secession, and against the war. Yet he prolonged all of them by fighting for what he called “my country.” And we sometimes forget that his memory, as well as that of other Confederate dead, have been used by evil men to intimidate and oppress our neighbors in the past. It is no wonder that such a reaction as we have recently seen would come along, rightly or wrongly. It feels more like the latter the more that history is replaced with hysteria. We see such hysteria at work in the ignorant attacks upon statues of Abraham Lincoln, and Joan of Arc in New Orleans, and Junipero Serra in California. What many do not realize is that the history is not really the driving force. Rather, we have entered into a new iconoclastic era. The word comes from “image smashers” and was made famous by the destruction of icons and church statuary in the Byzantine Empire of the 8th Century and again during the Reformation and the French Revolution. All were spawned by a cultural movement to divorce the culture from the past and refashion it. That’s what we see in our society today. Remaking the future involves changing the past, and our memorials are crushed by that revisionism. Human nature is that we tend to destroy those things we refuse to look at—things that make us afraid or ashamed or stand in the way of our agendas. But when making such important decisions, we need to keep our eyes wide open. Last month, I met with some of the men of the parish to talk about getting men’s ministry started again. We’re blessed to have men and to have women; we just need to be organized and active as male and female groups, which has been a staple of strong societies in history. Since many of our members are spread out (and generally, the younger we are, the more spread out we are) it occurred to me that getting together during the week could be difficult and discouraging. What if we set aside a Sunday to meet as groups of men and women? I presented the idea at my meeting, and everyone agreed. I think we should give it a try and see how it goes. It could be something we do temporarily, just to give us an opportunity to organize and plan when everyone can get together. Or it could be an ongoing feature of our common life. So this is how it will work: since we already have the first Sunday of the month as the occasion when I give a children’s sermon, let’s make that our “Family Sunday.” Instead of adult Sunday school on that first Sunday, I’m asking all of our men to get together and all our women to get together for a fireside chat. We have two fireplaces in our Parish Hall. The men can gather at the far one and the women can gather at the near one (with the Last Supper over it). Our initial goal will be to organize ourselves and plan for our common life. If we wish to continue the pattern, they can be regular times of planning, study, and fellowship. I’m asking each of you to participate. Pray for leadership and direction and encouragement. Our first gathering will be on October 1st at 9 a.m. See you then. This week, our provincial college of bishops met to consult about the issue of the ordination of women. At the formation of the Anglican Church in North America in 2009, many diverse groups came together to form one province. Some dioceses ordain women as deacons and priests; others do not. It was decided at the time that the province would have no female bishops and that the issue of women’s orders would be theologically studied and prayerfully discerned by the bishops. That five year study was recently completed. It did not present a conclusion or recommendation, but only a report on the issues and arguments involved. One significant thing it did acknowledge was that the two positions on the matter are incompatible. The bishops released a statement after this week’s consultation acknowledging that the ordination of women is a theological innovation and that there is no scriptural warrant for expanding the practice throughout the province. They also noted that individual dioceses continue to have the right under the constitution and canons to ordain women as deacons and priests. As far as I can discern, the reality behind the bishop’s brief statement (copies in the narthex) is that the traditional view has the majority among the bishops (including the archbishop) and it appears to be the emerging consensus if trends continue. There is a strong commitment to provincial unity among the bishops and there is not the desire to force a purge of the practice of ordaining women, especially when it seems that the issue will resolve itself over the course of a generation or so. That will require patience. It appears to me that the orthodox bishops, who had the numbers to force the issue and the likely schism that would result, would rather let the innovation die a natural death. One thing that is certain is that whatever decision came forth would be met with hurt and outrage and disappointment. Let us pray that they have chosen the wise path and that the Lord’s will may be done. Since we recently replaced the solenoid cell in the bell tower, we’ve begun to use the large church bell in the cross-shaped tower on our lovely church campus. I’ve heard many of you remark what a joy it is to hear it again. It’s been a number of years since we heard it, and it may be new for others, so a review of its main use in the Angelus may be helpful. We beseech thee, O Lord, pour thy grace into our hearts: that as we have known the incarnation of thy Son Jesus Christ by the message of an angel, so by his cross and passion, we may be made partakers of his resurrection; through the same, Christ our Lord. Amen. We ring the Angelus before the daily offices during the week and before the 8am Mass and at noon on Sunday. When you hear the bell sound, the customary response is to stop, stand, and bow your head in prayer (men remove hats) even if not in church. You may say the prayers along with the bell either silently or aloud. Perhaps you have seen the beautiful work by French painter Jean-François Millet called L’Angelus. It shows a woman and man out in the field with heads bowed. Off in the distance, you can see the church steeple, sounding out its bell across the land. The next time the bell sounds, please join us in this precious devotion. On Pentecost, we celebrate Jesus’ gift of the Holy Spirit to his Church. So what does that mean? What does he do? This space is far too limited for a full treatment of that question, but here is a rundown on the basics. The Holy Spirit is the third divine Person of the Holy Trinity. He first works in our hearts and minds and lives to bring about repentance, faith, and conversion. But then he really comes into our lives sacramentally through baptism. On that occasion, the Holy Spirit descends to wash our sins away, join us to Christ, and make us his holy Temple. Confirmation is the sacramental strengthening of the baptismal vows and graces for Christian living. So the seven-fold gifts of the Holy Spirit (according to Isaiah) are poured out on the baptized—the gifts of wisdom, understanding, knowledge, counsel, courage, piety, and the fear of the Lord. The gift of wisdom helps us discern the ways of the Lord, and follow his desires. Understanding helps us grasp the truths of the Church and grow in our faith. Knowledge is the gift that helps us see the truth and know God’s will. Counsel is a gift which gives us godly judgment in following holiness and serving the Lord. The gift of courage enables us to stand bold in our faith and to serve God with vigor. Piety, or “loving devotion” is the gift which brings compassion to all of God’s creatures and a pure adoration of the Creator himself. Finally, the gift of the fear of the Lord preserves our reverence for God who is almighty and is perfectly just and holy. S. Paul talks about other gifts of the Holy Spirit that are not necessarily given to all (like the ones above), but rather assigned individually according to the Father’s will (see 1 Corinthians 12). These are not so much given for our own benefit as they are for the benefit of others within the Church. The resulting fruit of the Holy Spirit is Christ-likeness. He works to make us more like Jesus. Sometimes when you are searching for the right word, you may not know what it is yet, but you do recognize when one contender is not the right word. That’s been my experience in the aftermath of terrorist attacks, most especially the recent one in Manchester, England. The word I hear again and again on the news is the word “tragedy,” but something about that didn’t sit well with me. Was it really a tragedy? What is a tragedy? The word means a “goat song” and comes from ancient Greek plays. It is a form of drama best known for having a sad ending, so we can see why it would be invoked about terrorist attacks. But there is more. A tragic end often is the unfolding result of bad choices made by the main character. Aristotle called this flaw in the protagonist hamartia. The tragedy, wherein we see the dramatic result of bad choices (and not just fate), is a vivid reminder to choose wisely. The prototypical tragic story in the Bible is the fall from innocence of our first parents in Eden. We also see the tragedy motif in the stories of Samson, King Saul, and King David. We see the tragic results of their poor choices. We see tragedy in many of the parables of Jesus. Another literary feature of tragedy is that the fear and pity evoked from the audience gives it a catharsis—an emotional release, and thus some emotional relief. We understandably want that relief. Calling it a “tragedy” is, perhaps unconsciously, an attempt to help ourselves feel better about it. But it is also a shield blocking our full appreciation of the facts. The Islamic State has been zealously murdering the most innocent people it can get its hands on, including children. ISIS makes no secret of its ultimate ambition—a global caliphate secured through a global war. Let us mourn with those who have lost their loved ones to this horrible ambition. And let us also be clear in our words. Murdering children is not a tragedy; it’s an outrage. One of my favorite books is The Meaning of Jesus: Two Visions, written together by Marcus Borg and N. T. Wright. They are both critical scholars, but take opposing views on various doctrines about Jesus. Borg represents the revisionist view and Wright the traditional view. Their dialogue of perspectives serves as a good primer on the field of critical study on Jesus and Christianity. I heartily recommend it. N.T. WRIGHT: “What then did the earliest Christians mean when they said that Jesus of Nazareth had been raised from the dead? They cannot have meant that, though his body remained in the tomb, his spirit or soul was now safe in the hands of God, perhaps even given a place of honor. . . . What the early church insisted about Jesus was that he had been well and truly physically dead and was now well and truly physically alive. . . . In addition, had Jesus’ resurrection been simply a matter of people being aware of his presence, there would not have been a sense, as there clearly is in all our evidence, of a sequence of ‘resurrection appearances’ that then stopped” (pg 116). MARCUS BORG: “Easter means that Jesus was experienced after his death, and that he is both Lord and Christ” (pg 130). “For me, the historical ground of Easter is very simple: the followers of Jesus, both then and now, continued to experience Jesus as a living reality after his death. In the early Christian community, these experiences included visions or apparitions of Jesus” (pg 135). Mothers have been celebrated in diverse cultures each spring since ancient times. The church has her own “Mothering Sunday” each year in Lent. Today, mothers are honored on different days in different countries. Our own American Mother’s Day goes back to 1870. The international congress Howe called for did not take place. But it goes without saying that mothers do make a difference in the world. Their role is irreplaceable. I feel that reality constantly. In the early 1990s, there was a delightful sitcom called Dinosaurs produced by Jim Henson’s company and Walt Disney studios. They live the typical life of a working-class American family, except that they are a family of dinosaurs in 60,000,000 BC. The family was a grandma, a mom and dad, a teenage girl and boy and a baby. The baby dinosaur said a few words here and there like “baby” and “Momma.” But a running gag in the show was that the baby would never said, “Daddy,” no matter how often prompted to do so. He would just point to his father and say, “Not the Momma.” Dads know what I’m talking about. Truer words were never spoken. Whether we had great moms or suffered because we had a terrible mom (or didn’t even know the one who bore us), we all instinctively know the value of motherhood. Let’s do our best to support moms in their difficult role and help them feel appreciated today (and every day). Happy Mother’s Day. Just as it is for businesses these days, a good website is indispensable for a parish church in the modern world. Our internet presence is the most visible presence to our neighbors. Hardly any visitor will attend a church for the first time without first checking out the website. I’m the same way. It should have vital information like location and times, and give some feel for the congregation before the actual visit takes place. A good website also keeps our old parish friends who are spread far and wide in touch with our congregation. It can also be an important center of connection and information for parishioners between Sundays. Our website has been somewhat static for awhile. We are working to bring it up to date, give it a good look, and make sure it is full of useful and current content. You have a role to play in that process. What do you want your church website to include? What information and resources would be helpful to you? What would you go there to find? Your answers to these questions can help us make our online presence all it can be. Let me know your input (texts and emails are best so I’ll have a written list of what we need to work on). We may not be able to do everything, but we should try to make it as best as we can. So far, I’ve added some new slides to our home page, put all of the Rector’s Ramblings online (yes, this one too), and updated information for visitors. The next thing will be to bring our sermons and teaching resources up to date. I want to thank our webmaster, Jonathan Rogers for helping me learn how to update our website with new content. I’m still learning. And I want to thank Debbie Blocker for taking some new pictures to use on the site. By the way, if you don’t ever want a picture of you or of your children to be used online, please let me know so I can make sure we honor that request. In preparation for this Easter, the Church of the Holy Sepulcher in Jerusalem underwent a long-needed multi-million dollar restoration. Excavations and cleanings were performed. The structure was also reinforced and made to last many centuries to come. Part of the work involved uncovering the original stone slab on which it is believed that Jesus lay in the tomb. The stone slab you can see before and after is actually a covering for the original. And some intriguing things were discovered in the process. One of the first things the workers noticed was a sweet smell. This is not too surprising for believers, who often report the same at shrines and holy places around the world. During the last partial opening of the tomb in 1809 by the architect Nikolaos Komnenos, the chronicle also mentioned a “sweet aroma” at that time. What scientists working with the construction teams noticed right away was that their instruments to take measurements on the tomb and original slab were affected by a very strong field of electromagnetic disturbance. When their instruments were placed on or around the original stone slab of Christ’s tomb, they either malfunctioned or ceased to work at all. Some who study the shroud of Jesus at Turin see this as relating to a recently developed hypothesis about the origin of the image on the burial cloth. Italy’s National Agency for New Technologies, Energy and Sustainable Economic Development [ENEA] concluded during a five-year-long study that the Shroud of Turin could not be a medieval forgery. The findings of ENEA study hypothesized that the image may have been created by an intense source of light, stronger than could be created by any technology currently available to man. Orthodox Christians see this light source as the same which ignites the candle of the Patriarch of Jerusalem at the tomb every Easter. In 2014, “nones” (pronounced like “nuns,” which makes it a bit confusing) made up roughly 23% of the adult population in our country. This up sharply from 16% in 2007, the last time a similar Pew Research study was conducted. During this same time period, Christians have fallen from 78% to 71% of the adult population. Religiously unaffiliated people are more concentrated among young adults than other age groups—35% of Millennials (those born 1981-1996) are “nones.” This is a major section of our mission field in the America of today and tomorrow. Despite what you might think, they are not mostly atheists or agnostics. Those only make up a third of the religiously unaffiliated. The “nones” are the “spiritual, but not religious.” They are those who have been turned off from organized religion. They are those who discount exclusive claims to religious truth or moral teachings. Some claim Baby-Boomer divorce has increased their number. They were typically raised in at least nominally Christian homes. The cause of this trend is complex, to be sure. If there is a key to reversing this trend, it is to reverse the failings that fed this trend. Knowing your faith, being clear about it and willing to talk about it, living the gospel, not letting religion become an isolated part of life, and building strong families are central to this endeavor. We know the nones are open to spiritual experiences. Let’s help them find something even greater than what they’ve been searching for. The International Bulletin of Missionary Research publishes an annual survey called the “Status of Global Christianity.” Using figures from 1900 as a baseline, it charts the changes over the 20th Century and half-way through the 21st Century. Some of these are encouraging and some are calls for concern. A major story over the century has been the decline of the faith in the first world and its explosion in the third. The most extraordinary Christian growth has come in Africa. There were 8.7 million Christians on that continent in 1900, growing to 542 million today, and perhaps 1.2 billion by 2050. By then, there will be as many Christians in African as in Latin American and Europe combined. In fact, the European share of the world Christian population has shrunk from 66% in 1900 to 23% today. The most astonishing numbers in the survey involve Pentecostal and Charismatic Christians, which represent the fastest growing movement in world religious history. In 1900, there were 981,000 Charismatics, today there are 643.6 million, and there are projected to be over one billion Charismatics in 2050. Of course, some in this category are non-Charismatic Christians who became Charismatic, often of the Word/Faith variety, which could be described as a pseudo-Christian prosperity cult. Rural churches have struggled with the gradual urbanization of the church. In 1900, 29% of the world’s Christian population lived in cities; today it’s up to 65%. But this is a trend that appears not to continue, with to decline to 59% being projected by 2050. The last major trend is the rise of Islam. The global Muslim population grew from 571 million to 1.7 billion in just the last 45 years, surpassing even today’s Catholic population of 1.2 billion. At best, Christians have held fairly steady overall with 34.5% of global population in 1900, 33.4% today, and a projected 36% in 2050. David Garrison has written a book called A Wind in the House of Islam. The “House of Islam” (Dar al-Islam in Arabic) is the invisible religious empire that stretches from West Africa to Indonesia, encompassing 49 nations and over 1.6 billion Muslims. Dwarfing the size of any previous earthly kingdom, Islam directs the spiritual affairs of nearly a quarter of the world’s population. Garrison explains that something amazing is happening today that is challenging the hold that Islam exercises over its adherents. Today, in more than 60 separate locations in at least 17 of the 49 Islamic countries, new communities of Muslim-background followers of Jesus are emerging. Each of these movements has seen at least 1,000 baptized believers and at least 100 member groups, all of whom have come to Christ over the past two decades. In some countries the communities number tens of thousands. The price these converts pay for their conversion has not diminished with the arrival of modern times. Qur’anic prescriptions remain unflinching: “…if they desert you, seize them and slay them wherever you find them” (Qur’an, An-Nisa 4:89). And these religious renegades are paying a high price for their spiritual migration to Christ. Yet they continue to come. What began as a few scattered expressions of dissent is now emerging as substantial and historically unprecedented numbers of Muslim men and women wading against the current of their societies to follow Jesus Christ. And Garrison explains that this is only the beginning. In Islam’s first 13 centuries you will find a handful of coerced conversions to the Christian religion, but only two voluntary movements of at least 1,000 Muslim conversions to faith in Christ. Yet, in the first dozen years of our century, we have already been able to identify 70 movements of Muslims to Christ. Which is to say, that 86% of all the Muslim movement to Christ in history has happened in just the last few years. This is what God is doing. There are over 7,000 unreached people groups across the world. What that means is that these are ethnic/cultural/national groups that lack enough followers of Christ and resources to evangelize their own people. They are dependent upon us to bring them the resources needed to plant and nurture an indigenous mission to spread the gospel. The Apostle Paul put it best in his Letter to the Romans: “How are men to call upon him in whom they have not believed? And how are they to believe in him of whom they have never heard? And how are they to hear without a preacher? And how can men preach unless they are sent? As it is written, ‘How beautiful are the feet of those who preach good news!’” (Romans 10:14-15). Worship. Another Lenten tradition is to increase our acts of piety and devotion. Consider committing to praying one or more of the Daily Offices from the Prayer Book at home with your family. Consider adding one (or one more) daily Mass during the week. We are also adding a Holy Hour before Mass on Wednesdays this year. Spiritual Reading. Disciplined reading from the Bible or from a Christian spiritual writer is a perfect devotion for Lent. Books are available for this purpose on a table in the Parish Hall. Take one. Perhaps my favorite collect from the Prayer Book is the one we use today. Part of it is that I’m captivated by the archaic turns of phrase. There’s something beautiful about the language alone. But beyond that is the subject. It is a kind of ode to love that is altogether lovely for its own sake. The Prayer Book and the King James Bible often use the word “charity” where we would often use the word “love” today (compare 1 Corinthians 13). Nowadays, we tend to think of charity as only about helping the poor and others who are in need. But the word was originally a strong version of the word love. It comes from the Latin caritas, as in today’s communion motet. It could be explained as conveying the sense of “costly affection” or “sacrificial love.” Although I can’t find any evidence to support my theory, I’m convinced that the English charity must be related to the Greek word for “grace,” which is charis. This week, countless men and women went in search of true love on Valentine’s Day. What many of them did not know (and we must tell them) is that true love is the charity of God. John the Apostle wrote, “Whoever does not love does not know God, for God is love” (1 John 4:8). And the Apostle Paul wrote, “God shows his love for us in that while we were yet sinners, Christ died for us” (Romans 5:8). Saint Valentine loved the Lord and his flock even above his own life, and became a martyr for it. In order to love someone else in the truest sense, we must first come to know the love of God. His love can strengthen us to love others completely. His love can empower us to treat others charitably. Archbishop Cranmer was right, the things that we do only have real value when done in love. A few years ago, Father Allen re-instituted the parish observance of the pre-Lenten season, or what is sometimes called Shrovetide. It was abolished in the revision of the calendar with the new lectionary. Epiphany became the green Sundays of “ordinary time” lasting until Ash Wednesday. But Shrovetide has had a little revival of sorts. A pre-Lent scheme was put back into the calendar of Common Worship (the modern Prayer Book used in the Church of England) as well the calendar used by the Anglican Ordinariates. Pre-Lent begins with three “gesima” Sundays. Of these, only Quinquagesima is literally named—“fifty days” before Easter. In fact, in Latin, Lent is not called “Lent;” it is called Quadragesima—the “forty days.” As in Lent, so in pre-Lent, the vestments are purple, the Gloria and Alleluias are dropped, and the dismissal is “Let us bless the Lord.” But Shrovetide is not quite Lent. Pre-Lent is actually the carnival season (or Mardi-Gras as they say in New Orleans). There is a certain festivity that attends to using up all the things to be abstained from during Lent. This week, we celebrated Candlemas, or the Presentation of our Lord Jesus Christ in the temple. Ordinarily, the male child who opens the womb would be “redeemed” under the Law of Moses, yet this child is the Redeemer himself. Interestingly, the Torah didn’t say to dedicate the baby at home, but to bring the child to God’s house. The temple sanctified the baby redeemed there, yet in this case, the temple itself is sanctified by the arrival of Christ who is the true Light of the World. Throughout the scriptures we find God calling on his people to come to some meeting-place for worship. First it was at sacred trees or groves or hilltops in the time of the patriarchs. Then at the Exodus it was the tabernacle in the wilderness. And then from the time of Solomon, it was a stone temple in Jerusalem. We can even find a hint of the idea of sacred space at the beginning of Genesis when Cain and Abel “brought” their offerings to the Lord. There was a special place designated for worship. What can we do in our own lives to make sacred space, or to put it another way, to make space sacred? The model is the church building. It is a place dedicated to praising the Lord rather than casual conversation. It is a place hallowed by prayer. It is a place with sacred furnishing and ornaments and images. And it is a place visited at sacred times. In developing a spiritual rule of life, one important element that can easily be overlooked is sacred space. And making that space sacred can facilitate great spiritual progress. Most of us will not have an extra room to turn into an oratory. But is there a place you can set apart just for the Lord and for your quiet time with him? A corner of a room? A shelf? A special chair? Or perhaps lighting a candle to set apart an otherwise ordinary spot? As Lent approaches this spring, let us be in search of some sacred space to be with God. In January, I issued a call to the women of the parish to a vigil of prayer for our men and for a men’s ministry in our parish. And I talked about some of the importance of men’s ministry in the typical parish. Now, I’m calling upon our men to pray this February for our women and their ministry. I certainly don’t think a parish should have a men or women’s ministry (or any other kind of group) “just because we have always had one.” But I do think that it would be good to be intentional about our spiritual lives and groups are an effective way to do that. We have men in our parish. We have women. How do they live out the Christian faith? Women’s ministry has been the backbone of parish churches since the days of the apostles, and for good reason. The Mother’s Union has been a staple of Anglican congregations world-wide and enabled the church to function especially well in missionary lands. We are accustomed to things like the ECW, diocesan women, and groups like the Daughters of the King, and now the Daughters of the Holy Cross. What shape would a women’s ministry take here? That’s up to them and the Lord. Men, let’s pray for their guidance. What we see when there is a strong group of women in the church is that it blesses the whole congregation. They show us what faithfulness looks like. And their life and witness helps us all raise up and nurture a new generation of disciples. I want to encourage the men of the parish to pray for our women. Pray for your wives and daughters, for your friends and neighbors. Give them some special encouragement this February. Show them some love this Valentine’s Day. Pray that God would bring insights and inspiration to our women, bring them together, raise up leaders, and get new women and girls involved in the life of being Christian women in our parish. In the epistle at Mass today, the Apostle Paul poses a rhetorical question to the deeply divided Corinthian congregation: “Is Christ divided?” (1 Corinthians 1:13). This Sunday falls within the Week of Prayer for Christian Unity which runs from the feast of the Confession of S. Peter (January 18) to the Conversion of S. Paul (January 25). The octave of prayer began in the early 1900s with Franciscans in the Episcopal Church, the Society of the Atonement, who were searching for reconciliation with the See of Peter. They were reconciled in 1909. One time as I was preparing a sermon, a sad thought came to me. If I were to one day become an Orthodox priest or a Roman Catholic priest and want to pull my sermon out of my old files and deliver them again, I don’t believe I would need to change a word (at least as far as statements of doctrine go). And yet, we are divided. I only mention it to point out how close we have come to Christian unity and yet how far away it still seems to be. We have overcome so many obstacles, and yet come up with new ones at the same time. God help his foolish people! Is Christ divided? No. The truth is rather more bleak—we are divided from Christ. The timing of the octave of prayer reminds that unity is to be found when we return to the confession of Jesus as Lord and pursue unity with the continual conversion that knocked S. Paul off his horse. It is time for us in the West to labor diligently to end our 450 year schism and for our Eastern brethren to end their 1,000 year schism. We cannot do it on our own, but God will not bring it about if we harden our hearts to his will. Let us continue to pray for God’s grace to accomplish his will. “Listen to me, you who pursue righteousness, you who seek the Lord: look to the rock from which you were hewn” (Isaiah 51:1). Sanctity of Life Sunday is usually the Sunday closest to January 22nd, the day in 1973 that the US Supreme Court handed down the Roe v. Wade decision that made abortion legal in all nine months of pregnancy. This year it is on the actual anniversary and this place holds special significance because Jane Roe (Norma McCorvey) and District Attorney Henry Wade were from Dallas. The landmark case that changed America originated right here. Abortion is still the leading cause of death in the United States. We have things to give thanks for (declining numbers of abortions and an increasingly pro-life outlook among young people), but there is still much work to be done. And our concern is not just for the unborn and for their mothers, but also for the forgotten and marginalized members of our society—the poor, the elderly and disabled, prisoners on death row, and those wrestling with suicide. Your parish has participated for years in the local March for Life, in offerings for Pro-Life ministries, and in training and equipping young women who make the choice to keep and raise the child to make positive life choices and improve their life skills. I am humbled to be a part of a parish with this commitment. As a church, we are committed to standing for and with those who are most vulnerable in our society. This commitment is reflected in the founding documents of the province: “God, and not man, is the creator of human life. The unjustified taking of life is sinful. Therefore, all members and clergy are called to promote and respect the sanctity of every human life from conception to natural death.” (ACNA Constitution and Canons, Title II, Canon 8, Section 3). Let us pray especially for changed hearts, for healing for all who have been involved in abortion or other end of life situations, and for a renewed appreciation of the value and respect for human life that is fitting for human beings created in the image of God. “Let us offer to God acceptable worship, with reverence and awe; for our God is a consuming fire” (Hebrews 12:28-29). I remember when I first started attending an Episcopal church regularly in college. The priest stood before the altar facing East for the canon, or Eucharistic prayer (as it should be). It was an older building with carpet and a dossal curtain that lent challenging acoustics. There was a microphone at the pulpit, but not at the altar. In contrast to the shouting consecrator mentioned above, another priest penned an article titled, “The Silence of the Canon Speaks More Loudly Than Words.” His title is a little misleading. There are really no “silent” prayers in the liturgy; they are all offered with the voice and not just the mind. But there are different tones of voice employed in offering them. Basically, things evolved so that all the parts that were normally chanted would be said with a full-throated voice when spoken. Other parts which might only need to be heard by those close by would be said with a mystical or subdued voice, or as the designation goes in rhetoric and music, “sotto voce.” Those which are more or less reckoned as the private prayers of the celebrant would be said in a whisper only loud enough for the priest himself (and God) to hear them. And so things like the collect, readings, creed, dismissal, and blessing are spoken loudly enough for the person on the back row to hear clearly. The canon and the words of administration are spoken loud enough for the bell ringer or the communicant to hear them. And of course, God needs not even a whisper to hear each of our prayers. It is difficult to overstate the importance of such a ministry in a parish. According to Barna Research, the typical congregation will be about 39% male and 61% female. It’s probably not surprising then that only about 10% of congregations have an effective men’s ministry. And it’s getting worse, not better. We’re losing our men in the churches of America. But I don’t expect S. Francis to be a typical congregation (Lord knows we are not—and that’s often a good thing! ), but this is an aspect of parish life that we are lacking and would be blessed in having. We are blessed with a share of men above the average, but we need to be organized (they do call it “organized religion” after all) and active. That can take different forms in different places. What form would God have in store for us? I want to encourage the women of the parish to pray for our men. Pray for your husbands and sons, your friends and neighbors. Encourage them to attend the diocesan men’s conference this year on February 10 and 11. I’d love to see the event swarmed with men from our parish. Pray that God would bring insights and inspiration to our men, bring them together, raise up leaders, and get new men and boys involved. Pray especially for our fathers. Maybe we should call them our “faithers” because research shows that when only mothers practice their faith, the children follow her example about 17% of the time. But when fathers practice their faith, the family follows his example about 93% of the time. At the annual meeting, we elected some new members to the vestry. Now I want to share with you what responsibilities have been assigned to each member. I have asked Bob Davis to serve again as the senior warden as we continue to transition to a new era in the life of our parish with me as your rector. Allie Goetz was elected junior warden and so her job will be to oversee the maintenance and improvement of the physical plant. Mike Salas was elected as the treasurer and Catherine Rogers was elected as the clerk. Kevin McNevins will again serve as the financial secretary. His job is to receive and record donations to the parish. Bob Lea will be the chancellor, which is the official legal advisor to the congregation and its leadership. Mitch Bramlett will be the almoner, who coordinates our involvement in various charitable activities and ministries. The almoner also manages the memorial fund. The in-parish services manager will be Rick Giles. This position oversees internal ministries like altar guild, acolytes, choir, ushers, nursery, coffee hour, lay readers, and carpools. Ray Pearce will be the events and facilities manager. Megan Pearce will be the education officer. This position involves overseeing Christian formation offerings like Sunday School and confirmation classes as well as being a liaison for such offerings outside the parish, like St. Michael’s Conference and Happening. Stephen Chamblee will be the communications officer—monitoring our informational and advertising efforts. Now you know who to go to regarding different areas of parish life. My thanks to all these good people who have chosen to serve. Prince Albert, the German husband of Queen Victoria, introduced Christmas trees to England in 1841. It is often assumed that this was a pagan custom appropriated by Christians in Germany, but that is not actually the case. The tradition began in Germany, but it started with a Catholic saint (an Anglican, in fact). It was the 8th Century Benedictine monk St. Boniface from the Anglo-Saxon kingdom of Wessex who first took the Gospel to the pagan Germanic tribes of Northern Europe. There, they worshiped Odin and Thor—fierce and ancient Norse gods. One of the savage aspects of Germanic Norse religious culture was human sacrifice. Boniface knew that Christianity had subdued the wilder, more violent aspects of Anglo-Saxon warrior culture in England and believed the same could happen in Germany. So Boniface let spread word among the tribes that when the next sacrifice was planned, he would personally prevent it. He gathered his monks at an ancient oak tree, a place of sacred blood-letting. The pagans bound a young girl to the oak tree in preparation, but before the fatal blow could be struck, Boniface grabbed the axe out of the executioner’s hands. He swung at the girl’s chains, breaking her free, and then turned his axe on the sacred oak. The pagans knelt in silence, expecting their gods to avenge this blasphemy. Boniface broke the silence, calling them to look at the base of the oak. There, springing out of the ground from between the roots was a tender young fir tree. Boniface explained that their other gods had fallen with the oak but that Boniface’s God had given them this little tree which remains green and full of life even in the depths of winter. The fir tree’s evergreen leaves pointed upwards to heaven, reminding them that the love of the Holy Trinity for them was everlasting. At the first Christmas after this event, Boniface brought a fir tree indoors into the church as a symbol of Christ’s everlasting love. It has been used as a Christmas reminder of God’s love ever since. Tuesday, December 6th is the feast of Saint Nicholas of Myra (yes, good ole Saint Nick). Myra is a diocese in Turkey. Little is known for certain about the life of Nicholas, except that he suffered torture and imprisonment during the persecution under the Emperor Diocletian. Nicholas was also one of the bishops attending the First Ecumenical Council of Nicaea in 325. His argument there with the heretic Arius became so heated that Nicholas slapped him across the face. He was honored as a saint in Constantinople in the sixth century by the Emperor Justinian. Many legends became popular about St. Nicholas. The most common is that the bishop saved three sisters from poverty and prostitution when he tossed three bags of gold through the window of their poor father’s house to fund their dowries. The saint is depicted holding these three bags (or sometimes three gold balls). He was also renowned as a giver of gifts to children. Many miracles have been attributed to his intercession. One is that he was aboard a ship of pilgrims travelling to the holy land. The sailors appealed to the bishop to pray to God for safety amid a fierce storm and the sea became calm again. His veneration became immensely popular in the West after the translation of his relics to Bari, Italy, in the late eleventh century. In England almost 400 churches were dedicated to him. Nicholas is famed as the traditional patron of seafarers and sailors, and, more especially, of children. As a bearer of gifts to children, his name was brought to America by the Dutch colonists in New York whom they called Sinterklaas. According to an old European custom, Nicholas visits the homes of good children on the night of his feast, leaving candies and gifts in the shoes of children left at the door. Let us honor the Christ-like character of this beloved saint and bid his prayers this Advent. The Apostle Paul described those in ordained ministries as “servants of Christ and stewards of the mysteries of God” (1 Corinthians 4:1). Chief among the holy Mysteries are the holy Sacraments of the Church. In the Eucharistic liturgy, the stewards or custodians of the chalice and paten are the deacon and subdeacon respectively. At the offertory, the deacon assists the celebrant in offering the chalice and holds the base firm during censing (so it isn’t knocked over by the thurible) and removes and replaces the pall over the chalice. At the communion of the people, the chalice is properly administered by the deacon. And what of the subdeacon? In a similar way, he is the custodian of the paten—the metal plate that the offering of bread lays upon. In traditional ceremonial, after it is offered up by the celebrant, the bread is put onto the linen corporal while the subdeacon holds the paten until it is needed again after the Lord’s Prayer. He holds it in a humeral veil, like a chalice veil that is big enough to wear. When the first Book of Common Prayer was issued in 1549, the ceremonial directions were minimal at best and it was not clear how to adapt the ceremonial that had been employed for a millennium to a new rite. This was complicated by the fact that minor orders (of which the subdiaconate is one) effectively began to be done away with in the Church of England when they were not included in the Ordinal of 1550. This meant that the ceremonies of Low Mass (in which the celebrant assumes everyone else’s liturgical role) became the standard for a few hundred years. When High Mass was restored in Anglican practice, the role of subdeacon was most often assumed by laymen. Different parishes modified the ceremonial to different degrees in order to reflect that reality of a layman fulfilling the role of subdeacon. In my view, as long as it is generally accepted for a layman to serve as a subdeacon in the liturgy, I see no reason to restrict him from doing so fully. Therefore, in this parish, I have removed the restrictions and modifications to the traditional liturgical ceremonial (as detailed by experts like Fortescue and in Ritual Notes). To me, it is a part of living out the fullness of our faith and our tradition and letting it flourish. If there is a need to modify something out of practical concern, that is one thing (like bowing rather than genuflecting for those with weak knees). But if there is really no need to modify such ceremonies, then why modify? This Advent, those serving as subdeacons will begin fulfilling their full ceremonial role at the High Mass. The Pilgrims struggled when they first arrived in the New World. A tribe of Native Americans called the Wampanoag helped them get through that first harsh winter when their tribal leader Massasoit discovered that their supplies from England would not be enough food to sustain the colony through the first winter. Imagine their surprise when one of those Indians, called Squanto, not only spoke English, but turned out to be a Catholic as well. In 1614, Squanto was captured by a lieutenant of John Smith who attempted to sell him and other Indians into slavery via Spain. However, some Franciscan friars discovered the plot and acquired the captured Native Americans. During this time, Squanto received instruction in the Christian faith and was baptized. As a free man, he traveled to London where he became a laborer in the shipyards. There he also became fluent in English. Squanto was able to return to his homeland five years after his kidnapping. Since he was fluent in English, Squanto became a valuable interpreter and teacher to the Pilgrims who settled at Plymouth. During that first winter, half of the Pilgrims died of starvation, of sickness, or of exposure. Squanto eventually contracted one of the diseases from Europe that were decimating his people. As he lay dying, he asked for prayers from Governor Bradford and bequeathed his belongings to his new friends in Plymouth. In God’s providence, a Catholic and a colony of Protestants had been brought together in the New World to help each other find God’s mercy. The prophet Malachi described the Bible as “a book of remembrance.” This is perhaps as apt a definition of Scripture itself as we shall find. Each time we read Scripture, we recall the wondrous things that the Lord has done among us. The remembrance of these things brings promise and reassurance to that which we are today, translating our own ordinary experience into an astonishing story of God’s providence and grace. The Bible has the power to transform us in the here and now as well as to change who we are to become. Scripture lays claim to us. Heraclites, an ancient Greek philosopher, declared that you cannot step into the same river twice. Each reading of God’s word is new. No one reads Scripture the same way twice. But Scripture, this book of remembrance, is paradoxically not just about the past. What we “remember” most as we read it are the promises to come. The Bible is the Word of God being written upon our hearts. It has the power to become our spiritual biography. In today’s collect we call upon the Lord “who caused all Scriptures to be written for our learning,” praying that we might “hear them, read, mark, learn, and inwardly digest them.” Note that the first four don’t mean a whole lot without the last part. The great skeptic and philosopher Voltaire studied the scriptures, but did not inwardly digest them. Only after much study and prayer can we hope to inwardly digest Scripture’s message and be nourished and transformed by it. The Bible is not unlike the manna of the Exodus. It is food for the journey. Each day, it is there for us once again. Every day it is just enough and never exhausted. If not gathered, consumed, and inwardly digested, its words become stale and useless to us—words in a dusty old book on a shelf, incapable of satisfying any hunger in the soul. But if we hear Scripture, read, mark, learn, and inwardly digest its message each day, you shall never go hungry. Charles Spurgeon said, “A Bible that’s falling apart usually belongs to someone who isn’t.” Let us read, mark, learn, and inwardly digest it. This book of remembrance is our food for the journey.